Ever since Georgia Gun Owners lifted the lid on, and exposed Stacey Abrams’ sponsorship of HB 731, gun owners across Georgia have perked up at attention. As we laid out months ago (and fought years ago) here, Abrams’ HB 731 would ban virtually all semi-auto firearms, types of magazines, and types of ammunition in Georgia, then most importantly, instruct the Georgia Bureau of Investigation to “seize” and “destroy” them. Ban. Confiscate. Destroy. 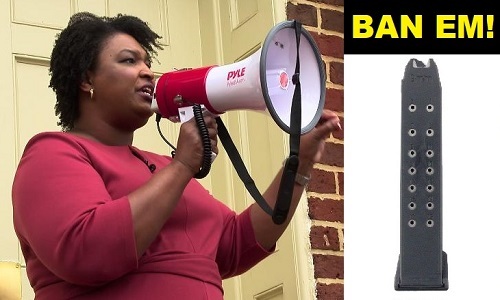 Think of those three words when you think of Stacey Abrams. Stacey Abrams wants to BAN all magazines in the state of Georgia holding more than ten rounds. Think about that for a second. Anything from a 30 round PMAG to a 17 round Glock magazine . . .
. . . and everything in between and larger. How many magazines over ten rounds do you think exist in Georgia? It has to be millions . 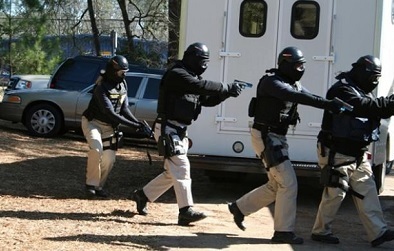 . .
Abrams wants to send the GBI to “seize” and “destroy” these magazines. Ban. Confiscate. Destroy. Don’t forget. Needless to say, this is the most draconian Second Amendment legislation — and candidate for statewide office — Georgia has ever seen. It’s no wonder anti-gun billionaires Georgia Soros, Michael Bloomberg, Tom Steyer, Phillips and Sanders (from San Francisco) have pledged at least $50 million to help elect Abrams and ram her left-wing agenda down our throats. But that’s not all, Bernie, Hillary, Al Sharpton, Kamala Harris, Obama, Cory Booker., Pocahontas, Valerie Jarrett, have all been through Georgia or will be coming through Georgia to lend money and support. Let’s get one thing clear — Abrams does not care about what you want or about your gun rights. She is hell bent on “changing” the South (and Georgia) forever, into a left-wing socialist paradise where only the police and military have the firearms. You may remember when we fought Abrams’ HB 731 in 2016.